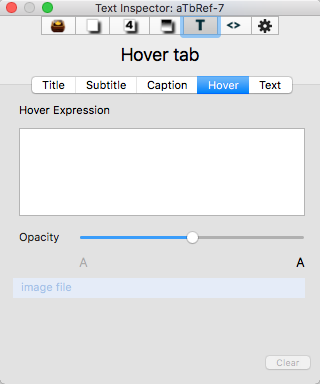 This tab controls settings for Hover Expressions. Opacity. Alters the note's $HoverOpacity. [image file]. Drop a bitmap image here to set $HoverImage. Clear. Button only enabled is a $HoverImage is set. click to clear the existing image.